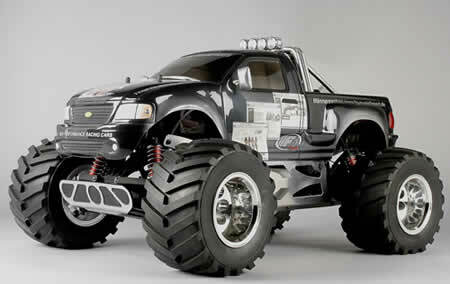 Whats the largest tc monster truck availible right now? for a price range of 300 to 500$? RE: WHATS THE LARGEST RC MT OUT THERE?! This one is large, but it's out of your price range. It's big but, no where near $500! It is more like $1200! i think the Mammoth, or MGT..mammoth is hudddddge! When i bought my Thunder Tiger MTA-4 i just bought the biggest truck the shop had, its a tiny bit bigger than the mammoth. Now ive been back into Rc's for a while and done some research, i think i bought the better truck as it happens. oh yeah, and those Mozler trucks, we call em Marder over in europe, if you check the german site, you can get em for about 600 euros, dunno if thatd be cheaper with the shipping added? Oh! Sorry, it was late (or early) and I did not notice the price range in the post. Unless you are looking for a Nikko ;-) then for the money I would suggest the Savage 25. It can be had for 389 on some websites and is pretty darn good in stock form. Anything else in that price range won't be much bigger than that really. The truck is made by FG. MolzerMowery is one of two US FG Importers. Again, MMR is not the manufacturer. The FG Marder is a different line from the newer FG MT (which has optional 4WD & RTR versions coming soon). So far, the FG Marder is also listed cheaper than the FG MT and the shipping to the US would probably be kind of high since I assume the truck weighs more than the standard Marder. Of course, the FG Marder Race (800 Euros) probably costs more to ship to the US than the FG Marder too. And since the Euro has risen over the USD, the pricing has increased but a US citizen shouldn't have to pay the European taxes. When i bought my Thunder Tiger MTA-4 i just bought the biggest truck the shop had, its a tiny bit bigger than the mammoth. the FG truck is not yet avalable anywere, but coming very soon, I suggest if you live in europe you buy there and if you buy in the US you buy from a dealer. the distributors are here for the sole porpouse of stocking and supplying cars and parts to dealers. so try and find a quality dealer near you or if you have a great hobbystore you enjoy dealing with have them contact a distributor to get them setup to sell. and yes they do not fit into your price model, but will cost very similar after the first month of playing with it. I know the what the measurements are for both trucks, but i stood in a hobby shop with em both on the counter in front of me and the BFT is definatly slightly bigger than the mammoth, thats why i bought it. ive had 37 years practise at using my eyes, im fairly good at it now. I just realised where the confusion lies, the mammoth is very slightly longer (the shape of the body on the Mammoth makes it look longer too) but its not wider, taller, or heavier, so in my book, the BFT is bigger. i got my mamoth for 369 plus tax 3 weeks ago, and its bigger than the savage. although the mammoth is like a big stadium truck, and a few people get frustrated with them cause they break as they are not built like other trucks. The issue of bashing vs. racing has been covered on just about every thread with "should i get a blank" in the title. for some reason people try to force me to believe that the mamoth i bash with is broken....and yet each time i look for all the broke parts i can't find one. ive never had a savage so i will not tell you or anybody that my mamoth is better, but i will tell you after i did the research i went the mamoth due to the truggy style chassis and the speed factor. almost completely ready to be raced and again as of yet still not broken. side note: i wonder if a savage has ever broke a part anytime it has been bashed? its tough to say a best truck, guess you need to know what you want, savage for bashing, mammoth for outright speed, t maxx for hop ups, MGT for racing? but i think any of them will do all of it to different degrees. But he did say biggest, so your looking at the mammoth or the mgt (depending how you define biggest) at the moment for that $500 budget. As the ol' saying goes, "That many people can't be wrong." There is a reason why so many people buy them. FWIW, I had a roommate back in college that wanted to be different and obscure, so he bought a Saab. What a POS. He paid dearly for that little stint of uniquity many times over. It is interesting to note that the first definition of obscurity in the dictionary is "absence of light," ...not usually a good thing. Plastic doesnt mean its bad. The savage's plastic is super thick.